After a few years of planning and waiting, demo at the triangle project site (Mt. Vernon Commons) has begun. The developer had until June to begin work or request a second extension. The first-12 month extension was approved last June. 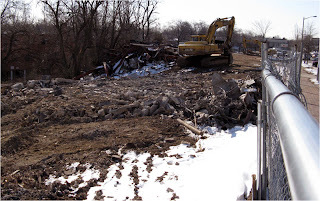 A couple of weeks ago, the construction fences went up, then last week, the buildings were leveled within a few days. Workers are busy clearing the site of trees and debris. The real-estate focused blog, DC Mud, posted a good recap of the project last month before things got started.